Use the OR operator || to have the program check if either of two conditions, or any of multiple conditions, is true. NOTE: In the example above, the if statement is actioned if the Bumper Switch is pressed or the V5 Robot Brain's screen is pressed. NOTE: It is easier to use boolean operators if the outcomes of conditions are considered. 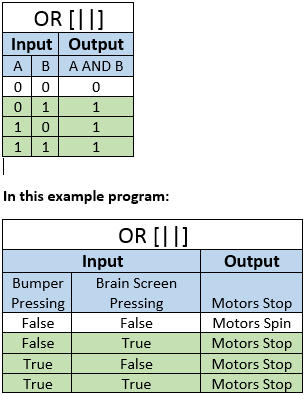 Logical truth tables like those below are used to track input conditions and output behaviors. //The robot moves forward unless the Bumper Switch or the Screen is pressed.